How would you describe the number of shelves of the growing trays in the image below? Four-leveled, four-tier, four-shelf or four-decker? Are all these ways correct and interchangeable? When they have wheels (casters), they can be called carts. 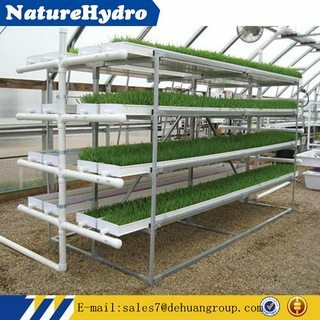 Typically, a seedling stand can have various levels called tiers or shelves. And the shelves are where the trays of seedlings are placed. In American marketing lingo, there are always attempts to be cute. You can say that a stand has four tiers (meaning levels) and then call it: A four-decker stand. Like a double-decker bus. But this is really marketing language and not a precise technical description. A four-tiered stand or a stand with four shelves or a stand with four levels (the least descriptive). The tiers or shelves are where the trays or pots are placed. To my ear, decker is an outlier there, register-wise. decker would not be used in a specifications document, say, as it is something of a colloquialism. Go and get me a four-decker shelf from the warehouse, and don't dilly-dally. We would like to place an order for a dozen of your four-tier shelving units. I would say "four-tier shelf" is the best way to describe it. "Level" is more reserved for buildings/structures. "Shelf" by itself conveys a meaning of just a number, but not necessarily that they are stacked in this matter, i.e., "four-shelf" can mean there are four shelves that are arranged side-by-side. Not the answer you're looking for? Browse other questions tagged word-choice word-request terminology register or ask your own question. what is the difference between frank and overt?